Setting the pre-cast concrete bridge deck panels at the Powell Creek. Photo courtesy of the MTA Long Island Rail Road. 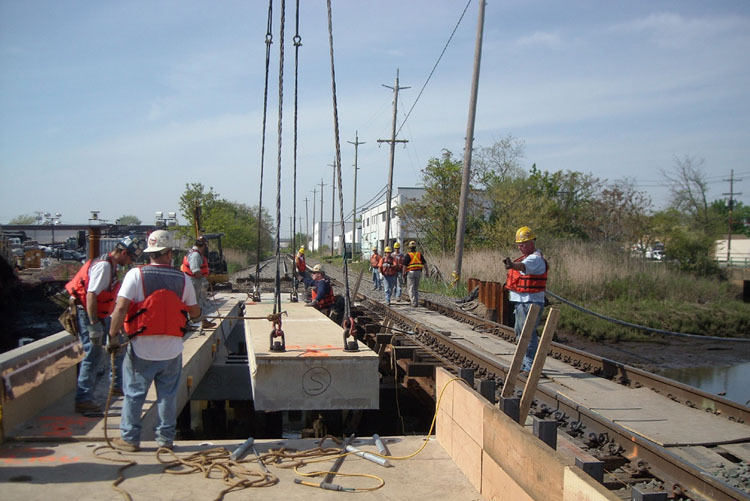 Buses will replace train service for Long Island Rail Road customers traveling between Long Beach and Valley Stream the weekend of Saturday, May 15 and Sunday, May 16 as work is completed on the construction of two new railroad bridges over Powell Creek and Hog Island Channel. The $24.5 million project, which is funded through the MTA Capital Budget and federal grants, began in March and is wrapping up as planned in time to accommodate the weekend beach crowds expected in Long Beach beginning Memorial Day weekend. Eastbound: Customers will transfer to buses at Valley Stream for stations Lynbrook through Long Beach. Customers should allow up to 34 minutes of additional travel time. Westbound: Customers will board buses at stations Long Beach through Lynbrook bound for Valley Stream, where they will transfer to trains to complete their trip. Buses will depart up to 33 minutes earlier than scheduled train times. Both the Powell Creek Bridge (located between the LIRR’s East Rockaway and Oceanside Stations) and the Hog Island Channel Bridge (located between Oceanside and Island Park Stations) were built in the 1920s, and have served the LIRR well for nearly 90 years. The old Powell Creek and Hog Island Bridges are open-deck wooden and steel structures supported by wooden piles through which water is visible below. They were replaced with pre-cast concrete structures, supported by reinforced concrete-filled, steel pipe piles, which will provide safer, closed-deck concrete roadbeds. The project will also alleviate a recurring flooding condition at Powell Creek Bridge, which has at times led to delays and temporary service suspensions, by raising the elevation of the bridge by approximately one foot. Bridge walkways will also be installed at both locations to make it safer for LIRR employees. For those interested in seeing a video showing the LIRR Long Beach Branch bridge replacement work, click here.